Do you have a favourite Elvis song? Whether or not you like him or his music doesn't change the fact that Elvis is a legend. Do you have a favourite Elvis song or album? I love Burning Love and Suspicious Minds. Oh man, I'm not so in the mood for Elvis! Darn, how did the word 'not' get in there?! I meant I'm so in the mood for Elvis. LOL! Wow, that's a tricky question! Surely it's an impossible task to choose a favourite. It depends on your mood, right? 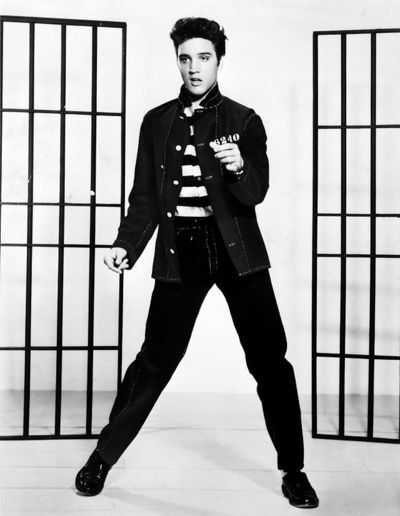 'Jailhouse Rock' for getting through the housework, 'Are you lonesome tonight' when you're feeling sentimental. They're all so different. In The Ghetto I think! Or Always on my mind. Too many to choose from! "Rubbernecking" or maybe "can't help falling in love with you"
Oh dear! What a question! I was never an Elvis 'fan' per se, but I did like his songs. My fav is probably 'Viva, Las Vegas'. Loved that movie! 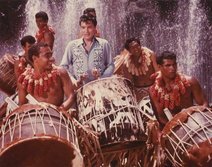 ''Drums of The Islands'' was my Fav. 1965. 'Such a Night' and 'Wooden Heart'. And maybe 'It's Now or Never'. Are there any songs in particular you like to blast? Which is your favourite instrument? What is a song you expect to hear or would like to hear at a wedding? Who is your favourite television personality? Have you ever posted something on the internet you wish you could remove? Does any cola drink compare to Coke? Are you happy for your child to use a gender neutral toilet at school?